In a world first, Dr Cornelius Hempel has simulated the bonds of lithium hydride and hydrogen molecules using trapped-ion qubits. This explores an important pathway for one of the first practical uses of quantum computers. An international group of researchers has achieved the world’s first multi-qubit demonstration of a quantum chemistry calculation performed on a system of trapped ions, one of the leading hardware platforms in the race to develop a universal quantum computer. The research, led by University of Sydney physicist Dr Cornelius Hempel, explores a promising pathway for developing effective ways to model chemical bonds and reactions using quantum computers. It is published today in the prestigious Physicial Review X of the American Physical Society. “Even the largest supercomputers are struggling to model accurately anything but the most basic chemistry. Quantum computers simulating nature, however, unlock a whole new way of understanding matter. They will provide us with a new tool to solve problems in materials science, medicine and industrial chemistry using simulations,” Dr Hempel said. 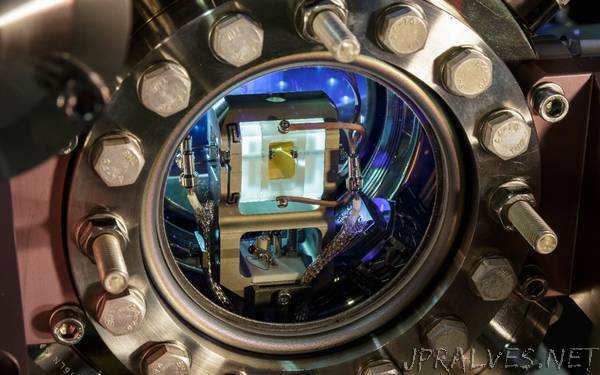 With quantum computing still in its infancy, it remains unclear exactly what problems these devices will be most effective at solving, but most experts agree that quantum chemistry is going to be one of the first ‘killer apps’ of this emergent technology. Quantum chemistry is the science of understanding the complicated bonds and reactions of molecules using quantum mechanics. The ‘moving parts’ of anything but the most-simple chemical processes are beyond the capacity of the biggest and fastest supercomputers. By modelling and understanding these processes using quantum computers, scientists expect to unlock lower-energy pathways for chemical reactions, allowing the design of new catalysts. This will have huge implications for industries, such as the production of fertilisers. Other possible applications include the development of organic solar cells and better batteries through improved materials and using new insights to design personalised medicines. Working with colleagues at the Institute for Quantum Optics and Quantum Information in Innsbruck, Austria, Dr Hempel used just four qubits on a 20-qubit device to run algorithms to simulate the energy bonds of molecular hydrogen and lithium hydride. These relatively simple molecules are chosen as they are well understood and can be simulated using classical computers. This allows scientists to check the results provided by the quantum computers under development. Instead of aiming for the most accurate or largest simulation to date, Dr Hempel’s work focused on what can go wrong in a promising quantum-classical hybrid algorithm known as variational quantum eigensolver or VQE. By looking at different ways to encode the chemistry problem, the researchers are after ways to suppress errors that arise in today’s imperfect quantum computers and stand in the way of near-term usefulness of those machines. Error suppression is at the core of research pursued in the University of Sydney’s Quantum Control Laboratory, led by Professor Michael Biercuk, who recently launched Australia’s first private quantum start-up, Q-CTRL. Dr Hempel, who did the experiments while at the University of Innsbruck, now hopes to leverage Sydney’s expertise to improve what can be accomplished with these kinds of simulations. The paper, published today in leading journal Physical Review X, was jointly written with Innsbruck Professor Rainer Blatt, a pioneer in quantum computing, and former Harvard professor Alán Aspuru-Guzik, who has since moved to the University of Toronto. He said that Dr Hempel’s decision to move to the University of Sydney in 2016 was an excellent addition to the strong quantum team on campus. “Theoretical chemistry and materials science are strengths at this university and they will be augmented by these latest techniques in quantum computation,” he said. The two leading hardware platforms in the race to build a quantum computer use either trapped-ions or superconducting circuits as quantum bits or ‘qubits’. There have been previous quantum simulations of hydrogen and lithium hydride bonds using superconducting qubits (by Google and IBM). The experiments by Dr Hempel and colleagues used laser-manipulated qubits stored in calcium ions trapped in an ultra-high vacuum environment called a Paul trap. Entanglement is a state of matter in the quantum world where individual components of a quantum system cannot be considered in isolation and become fundamentally linked. It is an essential prerequisite for the successful operation of quantum computers. An advantage of trapped ion qubits is that they exhibit ‘all-to-all connectivity’; that is, each qubit can be arbitrarily entangled with every other. Other quantum systems don’t have this. So, part of the simulation can be achieved with a ‘single shot’ operation rather than a series of concatenated processes. Many believe this will be a huge advantage when trying to simulate chemical processes in multidimensional space, beyond 100 dimensions, that will be required for simulating complicated molecules and reactions, like ammonia or caffeine. While trapped ion qubits retain their coherence, or ‘quantumness’ for much longer, they run computational operations slower than superconducting qubits, but are catching up with a 100-fold speed improvement reported in 2018. Dr Hempel’s experiment focused on the type of algorithm used to simulate these bonds: a ‘variational quantum eigensolver’. The VQE algorithm is a ‘shallow’ circuit, which means it needs less coherence time than the longer algorithms used by other approaches. This also means the algorithm needs fewer qubits and can achieve better results with ‘lower quality’ qubits, using fewer gate operations.